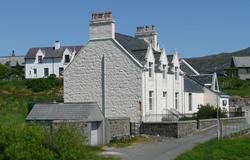 This house sits on an elevated site looking down on the bay of Lochboisdale. The house retains its grandeur style with its high ceilings and curved stairway. Large light lounge overlooking the bay, dining room, Kitchen with Cooker, Fridge, Dishwasher, Microwave, Crockery etc.